Irene has more than 30 years’ professional experience with environmental organizations, including roughly 20 years at FMR. After receiving her bachelor’s in biology from the University of Minnesota, she spent 12 years in upstate New York working as a naturalist, education program manager and communications specialist. 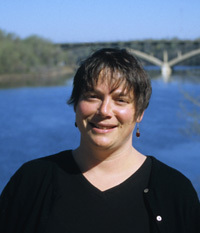 In 1999 Irene returned to Minnesota to take a position as FMR’s Outreach Director and spent several years building a successful stewardship and volunteer program. As FMR grew, her portfolio expanded to include river corridor land use, policy and advocacy work. As FMR's River Corridor Program Director, she played an essential leadership role advocating for new state rules for the river corridor. After 10 years of engaging with government officials and local activists, the improved rules were formally adopted in 2016. In 2019, Irene stepped down from her director position and shifted to a part-time role as a senior policy advocate for the river corridor program. She continues to work with state and local government and FMR River Guardians to influence decisions that impact the river corridor, including parks, economic development, and commercial and recreational uses of the river. In her spare time, Irene likes to spend time with friends, family and her dog Roxie.